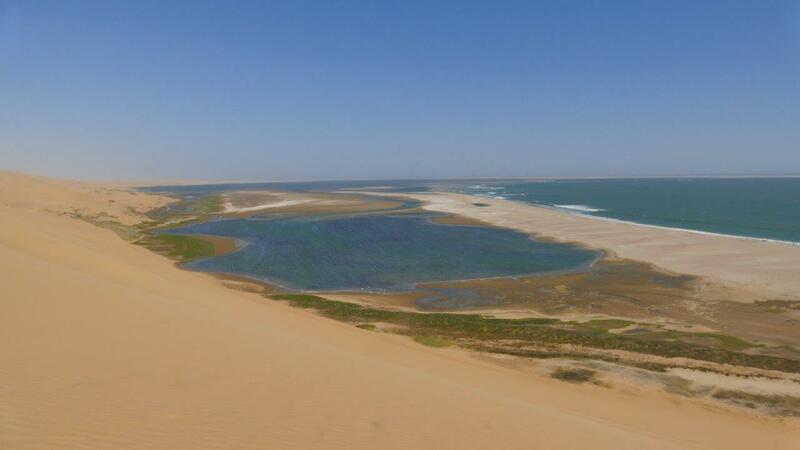 Sandwich Harbour is a natural tidal lagoon, squeezed between dunes from the Namib desert and the cold waters of the Atlantic Ocean, 55 kilometers south of Walvisbay in Namibia, inside the Namib-Naukluft National Park. 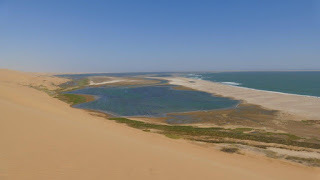 The large, shallow lagoon is surrounded by sand dunes up to 100 meters high, and is only accessible by 4x4 vehicles when tides and general wave conditions allow. Up to a few years ago, there were also freshwater wetlands north of the lagoon, but these disappeared over time due to shifting dunes and other natural causes. The surface area surrounding the lagoon is fed with seeping fresh water from below the sand dunes, supporting the large reed beds at the water’s edge. This in turn stabilize the dunes to some extent, preventing them from silting up the area. There is no clarity on the origin of the name Sandwich Harbour. Some sources claim it is due to a ship with the name Sandwich that anchored here around 1790, but we also heard other versions of the name’s origin. What can be said is that ships did anchor in the shallow harbour surrounded by a peninsula created from raised shingle bars, to process whale meat, harvest guano from the small islands, and get fresh water from the aquifer reservoirs fed indirectly by the Kuiseb river. Many artifacts dating back as far as a 1,000 years can still be seen in the area. Sandwich Harbour was abandoned permanently in the early 1900s, due to poor infrastructure and unstable accessibility as a result of the tidal influences. Today, Sandwich Harbour is mainly used for research and sightseeing. 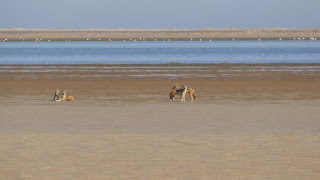 The only roads leading to Sandwich Harbour are heavy 4x4 sand tracks on the narrow beach during low tide, or changing tracks over the dunes during high tide when the sea water runs right up to the bottom of the dunes. 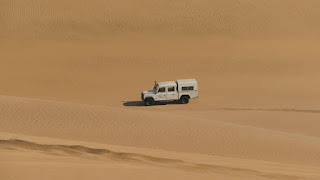 This all makes for an unique off-road driving experience with breathtaking sceneries. Only day visitors with valid permits are allowed access to Sandwich Harbour. 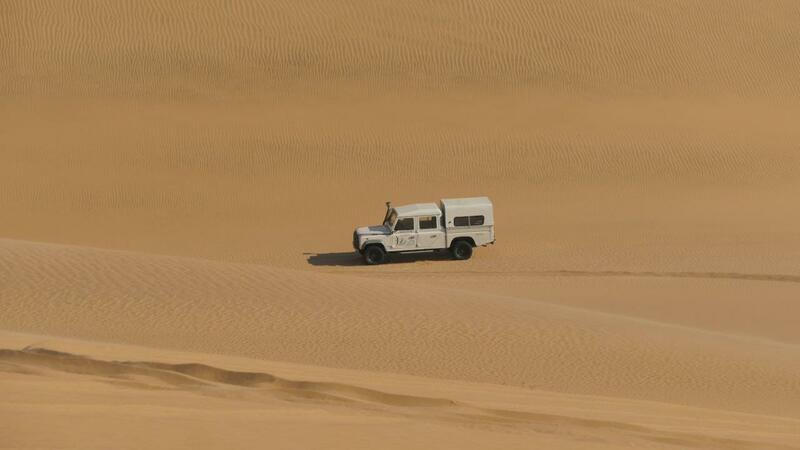 There are a number of tour operators in Walvis Bay and Swakopmund offering guided tours with 4x4 vehicles. The approach road to Sandwich Harbour, just south of Walvis Bay, crosses barren salt pans and hummock dunes covered with vegetation. Small groups of springbok, ostrich, jackal and brown hyena can be seen as well as raptors such as Peregrine Falcons, Pale Chanting Goshawks and Black-breasted Snake Eagles. The landscape changes dramatically as you encounter the huge wind-sculptured dunes closer to Sandwich Harbour. Sandwich Harbour is world famous for its abundant birdlife. The area hosts upwards of 70,000 birds, mostly seasonal migrants from the northern hemisphere. Guaranteed, common bird sightings include big flocks of flamingo, pelicans, grebes, as well as a huge variety of terns and waders such as the red data bird species Damara tern and the Chestnut-banded plover. 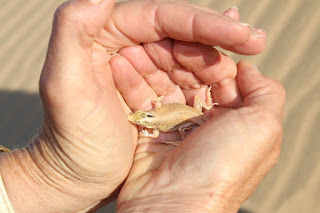 The Namib-Naukluft National Park is in one of the driest parts of the world. Most areas in Sandwich Harbour do not provide surface water. Animals and plants are very adapted to arid desert conditions and have learned to survive on moisture rich fog that sweeps in from the ocean in the evenings. 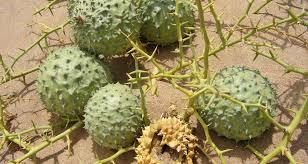 This includes small animals such as shovel-snouted lizards, palmetto gecko and the fog-basking beetles. The !Nara plant is the most significant plant in the Sandwich Harbour Area, providing shelter as well as food and water through its fruit. 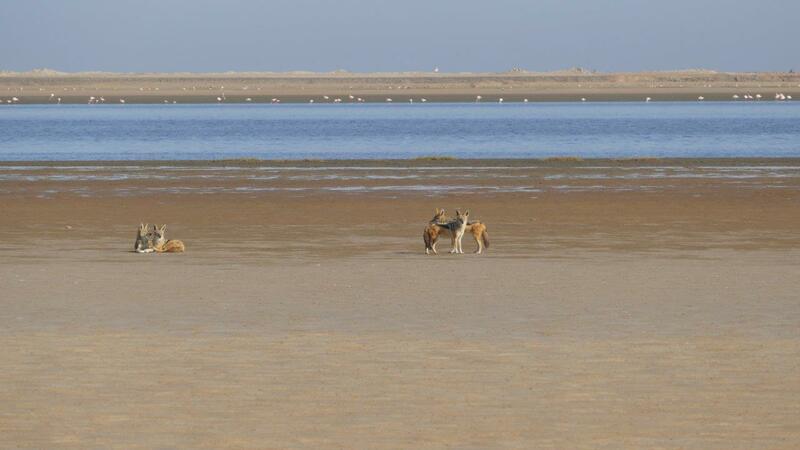 Sandwich Harbour was classified as a wetland of international importance at the same time (23 December 1995) as Walvis Bay, hence becoming one of Namibia’s first Ramsar wetlands. The total area for the Ramsar wetland is 13,825 hectares.